This consists of installing a new layer of asphalt (usually 1.5” to 2” thick) on top of an existing asphalt driveway, parking lot or road. This might also be referred as retop or recap. A hot melt and hot applied rubberized material used to seal cracks larger than ¼” to help prevent water penetration and damage to base. An asphalt that is designed to apply cold. The most common use is to temporarily repair potholes and damaged areas. Best for small repairs. A topical coating of black tar mixed with water and sand that is applied to asphalt to give it a refreshed appearance. The loosening of the rock and “fine” (aggregate) due to the oxidation of the oils (binders) that hold your asphalt together. The natural deterioration of your asphalt due to the elements that surround it such as weather, irrigation, fluid spills and traffic. The brown sticky oil that is applied to the existing pavement prior to resurfacing with a new layer of asphalt. This primer is what bonds the new asphalt to the old asphalt. 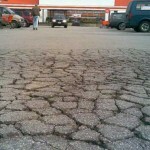 Cracks which develop on a driveway, parking lot or road that was recently overlaid. 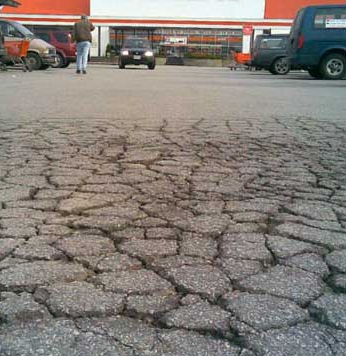 This condition can be avoided by installing a fabric that prevents premature cracking of the new asphalt. A Fabric used between the original pavement and the overlay to reduce the reflective cracking that may occur in the new asphalt surface.